Looking for an amazing deal? 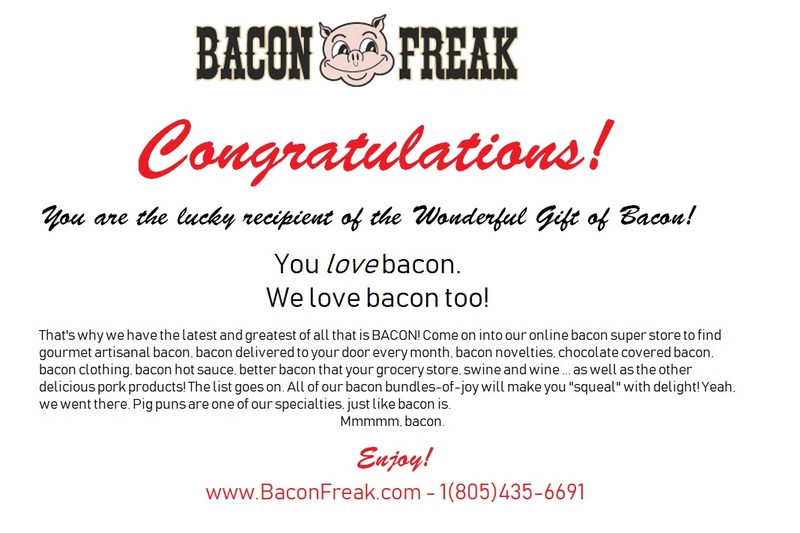 The Bacon Goodie Mystery Box delivers value along with an awesome stash of bacon goodies! We'll send you $70 worth of assorted bacon products for only $42.95. Examples of items you may receive include an assortment of bacon condiments, bacon spices, bacon apparel, and bacon candies and confections for the bacon enthusiast who wants to spice things up. Discover your next new favorite bacon item with this big box of fun. It's gonna be good! Note: Select your size for surprise shipments that may include apparel. This item may or may not include packs of uncooked bacon. For a family of confirmed meat eaters (especially bacon) this was a perfect gift. Everyone laughed and quickly laid claim to each item in the box. Great speed and was more than I ever expected. Great stuff! My sister was absolutely over the moon with happiness when she received this gift! Well done folks!